Preheat oven to 180 degrees Celsius. Line the bottom and sides of a small round cake tin (approx. 18cm in diameter) with baking paper. Place chickpeas, nut butter, honey, vanilla, egg, baking powder and bi-carb soda in a food processor. Blend until smooth. 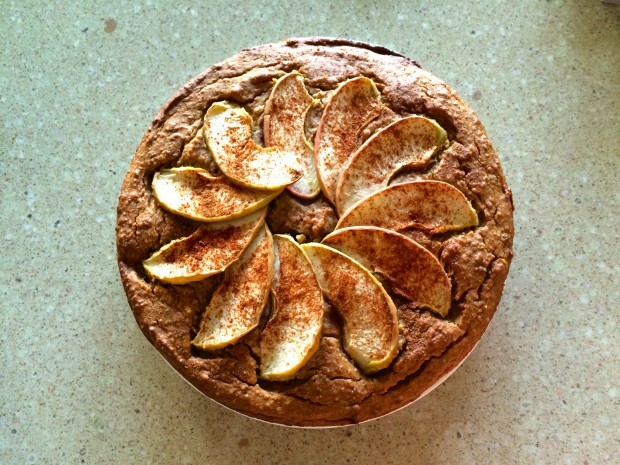 Pour cake batter into cake tin and top with apple slices arranged in a pinwheel shape. Sprinkle with cinnamon. Bake for around 50 minutes, or until cake is golden brown and a skewer comes out clean. Allow to cool in tin for 5 minutes before moving to a wire rack to cool completely. Serve with a dollop of yoghurt.